Thank you for downloading PDF Expert! If your download doesn't start automatically, please click here. PDF invoices, tax forms, research papers, and other documents store lots of data. The more files you have, the harder it gets to find what you need. That’s why it’s important to know how to search a PDF effectively. Fortunately, it’s easy to learn how to search for a word in a PDF file on Mac. Even a browser or a default Preview app can do it. Just open your document, hit Cmd + F, and type your query. 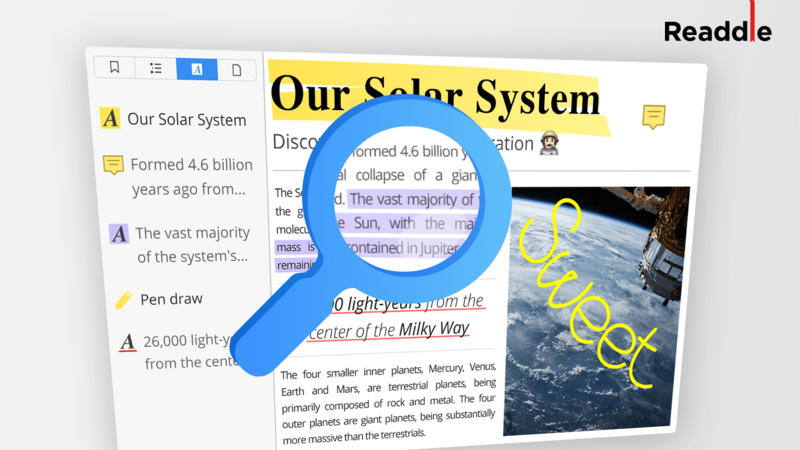 But what if you need to complete a more complex task, like searching through multiple files or finding a word or phrase in PDF comments? 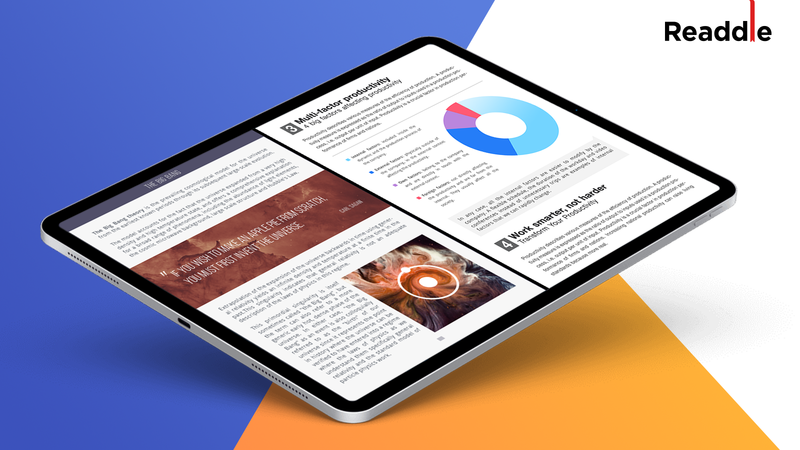 Our PDF Expert for Mac can do it for you. Let’s learn how to search a PDF like a pro! One last note before we start: Search works only in PDFs with text layers while scanned documents or flattened copies aren’t searchable. You’ll need to OCR such files first. Our team is currently working on the OCR feature, and we’ll add it to PDF Expert soon. Imagine you have a couple of reports or contracts and don’t remember which of them contains the data you need. Or you’re doing research and want to compare information on a particular topic from several different sources. How can one solve this task? If you have lots of free time, you can search through numerous PDFs one by one. However, there’s a more productive option! In PDF Expert, you can look for a word or phrase in multiple PDFs at once. This is a real time-saver for anyone working with documents. Open all the needed documents in PDF Expert. Its tabbed view is convenient to switch between multiple files. Click on the search field at the top right or just press Cmd + F.
Type a word or phrase and hit Enter. In search results, select All Tabs. PDF Expert shows the results from all opened PDFs! Click on a search result to jump to the corresponding page. Now, it’s easy to compare multiple documents and find exactly what you need. To see your search history in PDF Expert, click on the search field and tap the search icon . If you frequently do similar word searches in PDFs, this feature can save you a whole bunch of time! Comments and highlights are a crucial part of your PDFs. 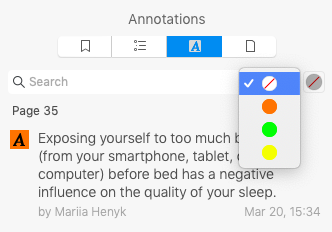 Annotations define a document’s key points and enrich text with your feedback, thoughts, and observations. They deserve to be searchable! Click at the top left and select the Annotations tab. Here, you can navigate all your highlights, comments, and sticky notes. Slightly scroll down to reveal the search field. Tap the search field, type your query, and hit Enter. Voila! 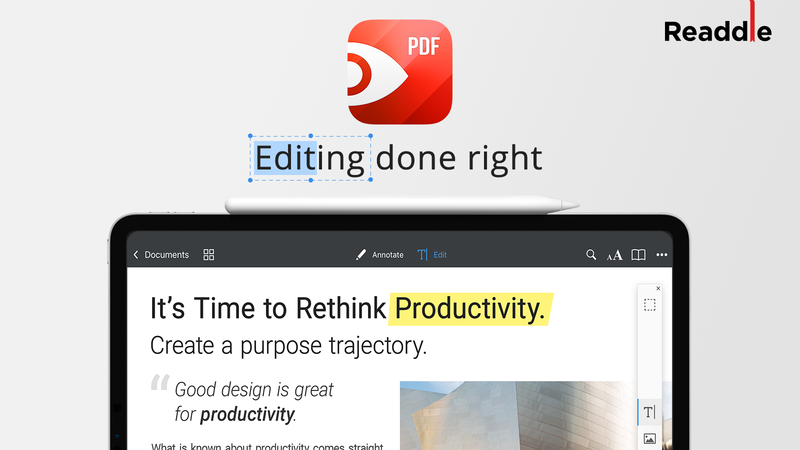 PDF Expert searches through the highlighted text, comments, and even sticky notes. Click on an annotation to go to the page containing it. Select and go to the Bookmarks or Outline tab. Scroll down to see the search field. Color coding is a great way to organize your notes. Let’s say you highlight new terms with yellow, use orange for names and blue for funny quotes. How do you quickly find all the orange highlights? The only option in most PDF readers is to scroll a document looking for annotations. Fortunately, PDF Expert makes color coder’s life much easier! Click at the top left and go to the Annotations tab. Scroll down to make the search field appear. Tap on the color wheel near the search field. Choose a color. You’ll instantly get all the corresponding annotations! PDF Expert’s handy redaction tool makes it easy to hide sensitive data in any document. You can quickly blackout or erase names, addresses, credit card numbers, and other information not intended for sharing. The best thing is that you don’t need to spend much time to look for the data you want to conceal or manually redact repetitive text. With PDF Expert, you can quickly find the needed words or numbers and hide them in mere seconds. Select Edit on the top toolbar. On the right sidebar, select one of the options: Blackout or Erase . Click Find and Redact . Type the word or phrase you want to hide. Select a search result and click Blackout/Erase. Or tap Blackout/Erase All to redact everything at once. Click Done. That was pretty fast! We’ve discussed how to search for a word in a PDF file. However, sometimes you need to find the PDF document itself. 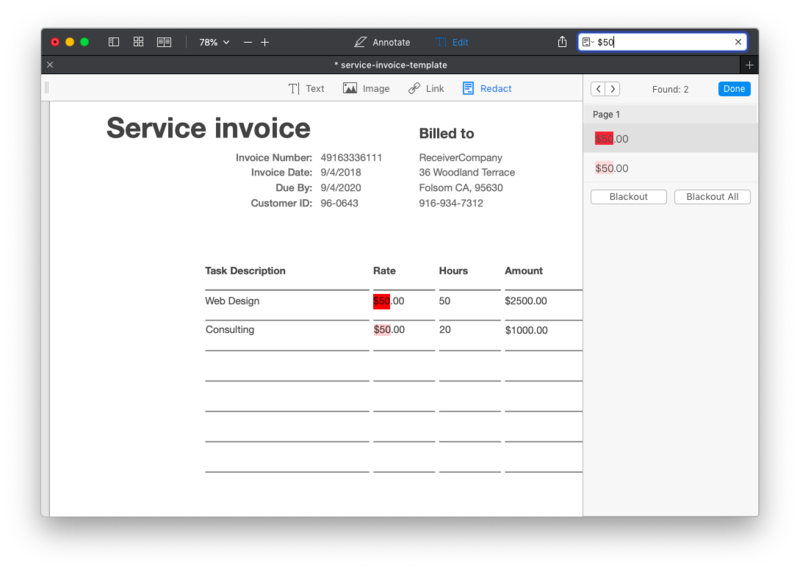 For example, you want to download a tax form or invoice template. Include filetype:pdf in your search query in Google. E.g, “form 941 filetype:pdf.” With this handy little trick, you’ll see only PDF files in the search results. 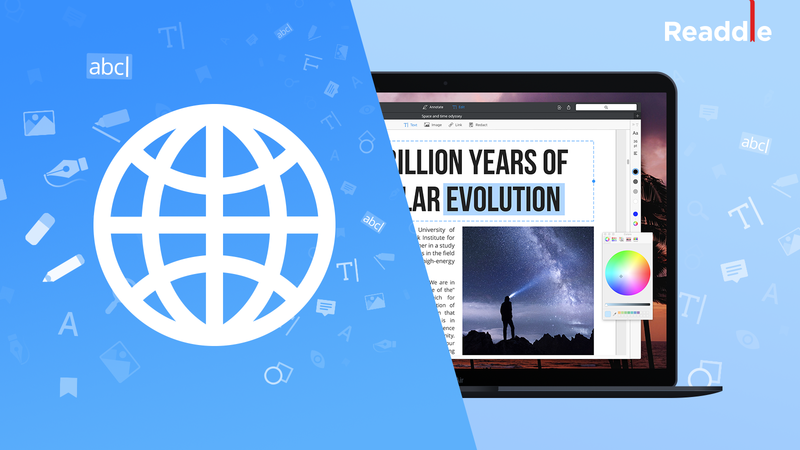 When you find the needed file, download and open it in PDF Expert, the best PDF editor for Mac. 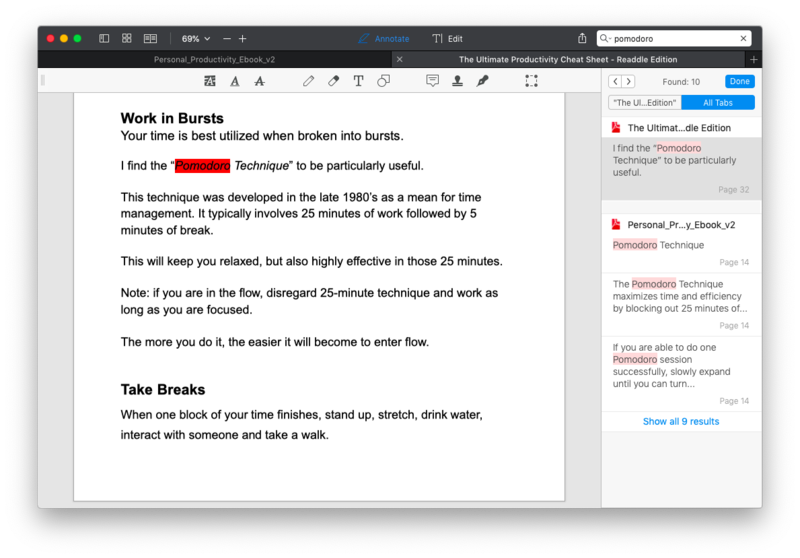 It offers a powerful set of features, from text editing to merging PDFs. As you’ve learned how to search a PDF on Mac, you’ll always find everything you need in your documents. Download PDF Expert for free or buy the full license right now! 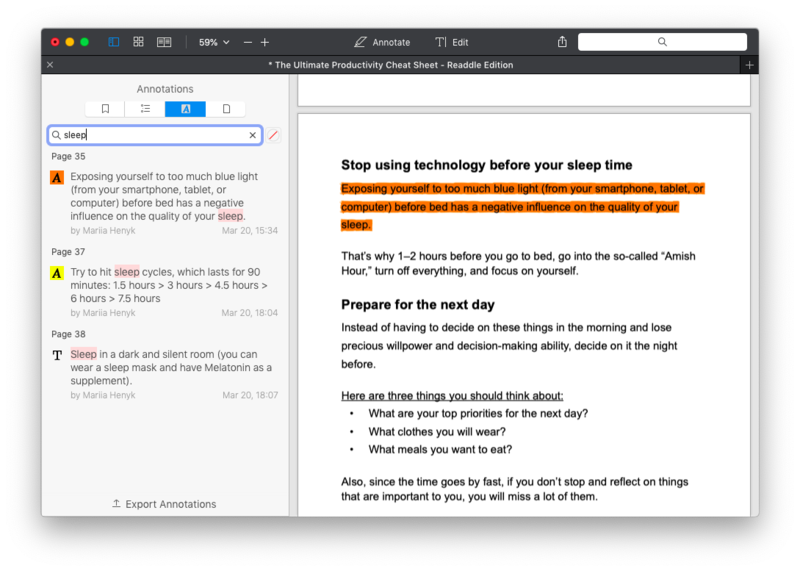 Online PDF Editor or a Desktop App — Which One to Choose?